There are two type of rotary filters and the first is similar to the leaf filter were the liquid with the suspended solids are pumped through a rotating filter section and the solids are retained until they are concentrated. Another version of the rotary filter is the rotary drum filter where a drum rotates into the liquid solution and the drum is under vacuum while that portion of the drum is submerged. The drum is also wrapped with a filter media to remove the solids from the stream. The vacuum process continues while the drum is rotating. The fabric is a continuous stream that is then pulled away from the drum and doubles back to discharge the filtered materials. 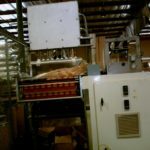 Universal Machine Company, side by side, vertical, continous motion, form, fill, seal machines, rated from 20 to 70 bags per minute each side – depending on materials and application. Bag size range of: 3" to 12" in Width x 3" to 15" in Length with proper change parts. Equipped with dual, ASE servo driven auger fillers with 22" diameter stainless steel product hoppers 6" OD porduct ports and covered site port, dual side belt film assit, with 13” long x 1" Thick hot knife horizontal seal jaws and 17” long vertical lap seal, gas flush, film registration. Microprocessor PLC controls, with control panel and mounted on 4 leg height adjustable base frame. 20" maximum web width. Universal Machine Company, side by side, vertical, continous motion, form, fill, seal machines, rated from 20 to 70 bags per minute each side – depending on materials and application. Bag size range of: 3" to 12" in Width x 3" to 15" in Length. Equipped with dual, ASE servo driven auger fillers with 22" diameter stainless steel product hoppers 6" OD porduct ports and covered site port. Dual side belt film assit, with 13” long x 1" Thick hot knife horizontal seal jaws and 17” long vertical lap seal, gas flush, film registration and safety guarding. Microprocessor PLC controls, with remote controller, A/B panel view and mounted on 4 leg height adjustable base frame. 20" maximum web width. 6-up, vertical, form / fill / seal machine, rated from 10 to 70 cycles per minute with number of product – depending on material and application. Maximum pouch size: 450mm in Width x 400mm in Length. Currently set for 6-up with a pouch size of 65mm in Width x 95mm in Length each. Equipped with product hopper, side film roll, film pull wheels, registration, two lobe horizontal cross seal arbors, side sealers, slitters, static eliminator and cut off knifes. A/B controller. Film Specifications: 900mm OD wide film roll on 150mm OD core.